By Dave Stauffer November 17, 2013 A C Hunt Congressional Cemetery Denver Governor A C Hunt Isa Hunt John Curtis Underwood Lincoln Park Parks Washington D.C.
Alexander Cameron Hunt (1825 – 1894) – Find A Grave Memorial (link). I thought this link was worth it’s own little post. After A C Hunt left his home in Denver, his planned RR to Mexico was failing, and so was his health. He suffered a stroke in Illinois, and sought recovery in Washington, DC. In his remaining days, he was married to Alice Underwood, who bore him a daughter, Gloria. 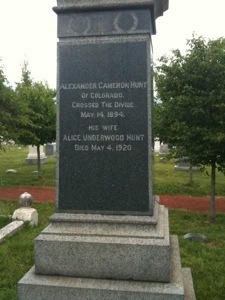 A C Hunt is buried in Congressional Cemetery, with his second wife, and father-in-law, John Curtis Underwood, who was a prominent US jurist, known for his anti-slavery views and his ruling that authorized Confederate property to be confiscated during Reconstruction. Upon hearing of her father’s passing, his daughter, Isa, came to DC was shocked to meet her new family. She was said to have returned to Colorado with some bitterness.